Sunshine or snow this weekend? How the Met Office got confused. 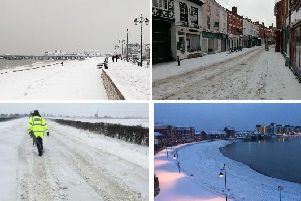 Large parts of the country are set for a scorching weekend as forecasters predict an outbreak of summer sunshine at last, so why did the Met Office issue a weather warning for snow in our region? Thursday was officially the warmest day of the year so far, with the temperature reaching nearly 21C - and the good news it’s going to get even hotter over the weekend. Forecasters say temperatures could hit a sizzling 77F (25C) on Sunday - warmer than Rome, Madrid and Ibiza - as summer finally arrives. And yet the predictions came alongside the Met Office yesterday issuing an amber snow alert for parts of the south-east as they basked in sunshine. Alex Burkill, a meteorologist for the Met Office said the bizarre mistake was likely the result of in-house testing. He said: “I know there was testing happening and as far as I am aware it was a test that managed to slip through. The Met Office confirmed that the mercury soared to a 2016 high of 20.8C (69.4F) in both St James Park in central London, and Northolt, north London, on Thursday lunchtime - just eight days after much of the country endured snow. The figures beat the previous highest mark this year of 20.3C (68.5F) recorded at Porthmadog, Wales, back on April 21. But the Met Office says Thursday’s temperatures will be put in the shade over the weekend as warm tropical air arrives from southern Europe. Met Office forecaster Emma Sharples said: “It is looking like we’ll see temperatures increasing day by day over the weekend with Sunday being the warmest. “On Sunday we could be looking at temperatures in the mid-twenties: 23, 24 even 25C. She warned that people with allergies should take precautions as pollen and UV levels will be high.